This blu-ray review of Maleficent will be an unusual two part review as the only time I have seen the movie is on the Disney blu-ray so I will be going over the movie and the quality of the disc. 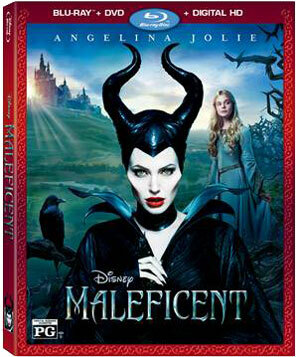 Maleficent is a retelling of the classic Sleeping Beauty movie but from the point of view of the villain. Disney purists may have a problem with it but lets face it, the original was also a retelling of a classic story so get over it people. However, as this is Hollywood and Hollywood is rarely original, this film borrows heavily from Wicked (which tried to humanize the Witch from the Wizard of Oz) and from bad sword and sorcery movies from the 80s. With admittedly much better effects. The sad thing is, with a better hand at the helm and a more focused vision, this could have been a classic film. Unfortunately it’s not. Outside of Angelina Jolie, who dominates the screen every time she has a scene, the rest of the cast and movie is just blehh. As for the blu-ray itself, while being short of extras that are truly worthwhile, I will say that the video and audio quality are out of this world beautiful. For fans of the movie, you would be hard pressed to find a more beautiful way to watch it.